Services | Reliable Transfer Corp.
We know that local moves can be exciting and also unsettling, but with Reliable Transfer by your side there is nothing to it! We would like to help you understand the way your local moving charges are determined. We want nothing more than to help you get an accurate estimate so there won’t be any surprises come the day of your move. If you have any questions, please don’t hesitate to give us a call about our residential and commercial moving services. Whether you’re moving across the state, the country, or the world, we are here to help you through your moving process. We offer both full service and partial-pack service, and all moves include packing materials. Please contact us about our residential and commercial moves departing from or arriving in Juneau. When it comes to international moving, we really shine. Our know-how and experience are time-tested and unsurpassed. Whether your destination is South America, Europe, Asia or anywhere else, you can count on us for great transportation and great customer service. Let us come to your home to give you an estimate on an international move and a bottom line cost that includes packing materials and transportation from door to door. We can help to prepare and execute your residential and commercial move beginning in Juneau. When it comes to residential and commercial moving, we are fully licensed and insured; our valuation coverage spans from the starting point of your move to the final destination. A client representative can explain the price structure and help you determine the amount of protection you will need. We have a customized storage system that is meant to accommodate any storage load – no matter the size. We are fully able to serve your needs equally whether you need a place to store a few extra items or a whole houseful of furniture for your new home. Trust that your storage venture with us will be worry and stress-free. Reliable Transfer wants to help make your move as rewarding and stress-free as possible, whether you’re moving across town or across the country. Naturally no two moves are quite the same. Fill out a free estimate form to get an approximate quote. 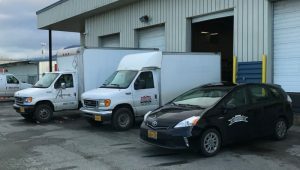 Reliable Transfer Corp. is pleased to offer commercial courier services to the Juneau business community. We have three drivers covering the Juneau road system, and one of them is never far away. We believe that we can offer your business an increase in efficiency compared to the cost of your employees having to undertake these trips themselves. As the weather changes to rain and snow, we are already underway and ready to serve You. Please give Reliable Courier Service a call at 789.1490 for information about our services or to request a competitive quote. 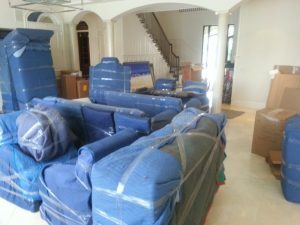 In addition to our moving and storage services, we provide a full range of packing and shipping materials available for consumer and commercial purchase. Our huge range of boxes and packing materials can adapt to any moving situation. Give us a call for more information today.